Photo taken at the end of January 1945 looking southeast from a temporary watchtower (visible on Photos 21 and 23) over the shapeless ruin, of Krematorium V as they were left by the SS and found by the Russians. There is a light covering of snow. 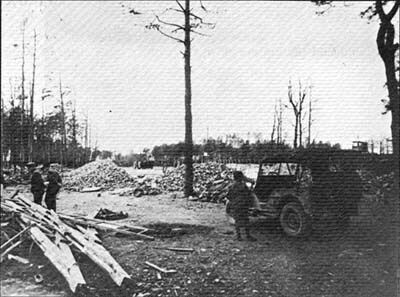 In the foreground is a stack of logs, fuelwood for “normal” cremations Work on clearing the ruins was to begin shortly after this picture was taken. 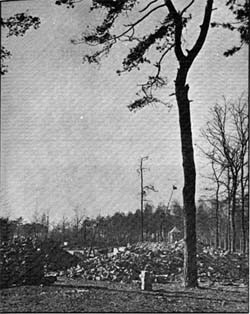 Photograph of the cleared foundations of Krematorium V in February-March 1945, looking southwest from a second temporary watchtower erected to the northwest of the Krematorium and now dismantled The rubble from the ruins has been thrown aside to form a continuous mound around the foundations of the building. In the middle ground, a few metres from the drainage ditch, are excavations concerned with the cremation ditches. View looking in the same direction as the previous one, but taken from the foot of the watchtower. 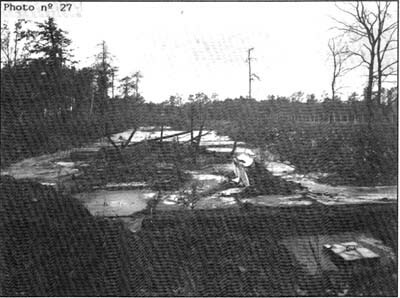 In the foreground is drainage ditch “Graben L.I” and the barbed wire fence “Zaun 35”. On the extreme right in the background is the temporary watchtower from which Photo 19 was taken. View of the reins of Krematorium V, looking west, after clearance of the rubble in March 1945. Despite the heap of rubble, parts of the iron frame of the 8-muffle furnace, twisted by the dynamiting of the building, and a barrow used used for clearing the foundations can be seen in the center. View of the ruins of Krematorium V in March 1945, looking northwest from beside the Ringstraße. On the left are the nailed roof trusses, designed by Konrad Segnitz and installed by Industrie-Bau AG, In the right background is the first temporary watchtower, from which Photo 19 was taken. The second is not visible being further to the right. 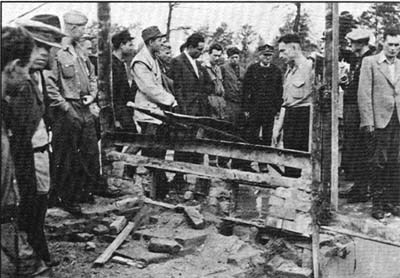 This photo demonstrates the intention of the Soviet and Polish authorities at that time to reconstruct Krematurium V, for all the recoverable components of the building were stored. In the end only Krematorium I of the Stammlager was fully reconstructed. The remains of the two northwest muffles of the 8-muffle furnace, with a “Leichenbbrett / corpse stretcher” used for charging the corpses, leaning against them. At the feet of the man on the right is the stoking pit where coke was fed to the hearths. 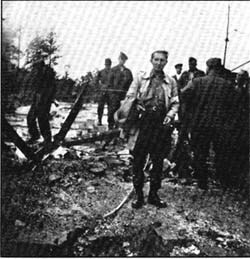 Worthy of note at the beginning of 1945 is the diversity of the clothing of the Polish and Soviet visitors, a mixture of recuperated German civilian and military dress. Photo of the twisted frame of the 8-muffle furnace of Krematorium V, belonging to the same series as Photo 24. Looking west. 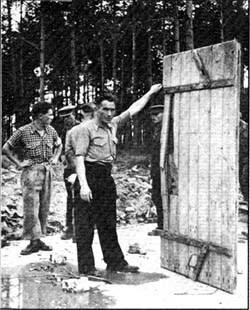 An almost intact gas-tight door found in the ruis of the western part of Krematorium V and presented by the man in short sleeves from Photo 24 (with the shaved neck). This door has no peephole even though it was used for homicidal gassings. It is at present conserved in Krematorium I of the Stammlager, in the stoking pit of the third furnace. View of the foundations of Krematorium V, looking west, taken between 1945 and 1950, before the partial rebuilding of the walls. In the foreground is the eastern entrance, with on the right the WC/washroom and the coke store. In the center are the twisted remains of the iron frame of the 8-muffle fumace. Bottom right is a concrete sewer manhole cover with a steel handle. A similar cover has been mistakenly placed beside one of the Zyklon-B introduction openings in the roof of the Krematorium II gas chamber.